This package includes all installer versions for Windows, Mac and Linux. DEMO IS NOW VERSION 11 (X-Plane 11). Read our full review of XP11 here. While enthusiasts of all experience levels use X-Plane, it is best suited to experienced pilots that want the most accurate flight dynamic possible. X-Plane’s exclusive flight dynamics model, called “blade element theory,” evaluates the forces on multiple sections of the aircraft’s surface, providing a constant and reliable prediction of how it will react to those forces. This provides a realistic flying experience and makes aircraft development simpler and faster. In contrast, Microsoft Flight Simulator, X-Plane’s biggest rival, uses lookup tables to determine flight drag and lift. This works well for existing aircraft where the table data is already known. It is less effective for creating new aircraft or predicting the reaction of an airplane in experimental situations. Default Cessna 172SP in X-Plane 11 with sunset in background. While X-Plane is a paid product, the free demo version of X-Plane 11 has the same aircraft, flight model and technology. X-Plane’s powerful flight dynamics model allowed the developers to create a wide variety of aircraft. Users can choose from single and multi-engine planes like the McDonnell Douglas KC-10 Extender, Boeing 747-400, and Lockheed Martin/Boeing F-22 Raptor; the Space Shuttle; helicopters such as the Bell 47 and Sikorsky S-61; VTOLS such as the Bell-Boeing V-22 Osprey and much more. Users have developed over 1400 additional aircraft which can be downloaded from our own file library here or X-Plane.org and other sites. Enthusiasts can even design, build, and contribute their own aircraft. X-Plane’s accurate flying characteristics make it perfect for scientists and engineers studying the reactions of both fixed and rotary-wing aircraft. Pilots can keep their skills sharp by using different airplanes and helicopters, and aviation hobbyists can experiment with flight dynamics. Pilots can explore almost every inch of the globe, from 74 degrees north to 60 degrees south latitude. Adventure awaits- users can touch down at any one of 33,000 airports, land on an aircraft carrier, try to settle softly on a frigate bobbing in roiling surf, or land on a helipad on skyscraper overlooking a vast city. With X-Plane, pilots can take an X-15 to outer space; take the Space Shuttle for a spin, battle raging forest fires, and more. Every great pilot knows how to handle tough weather. X-Plane will test them to the limit with wild rainstorms, wind shear, crackling lightning and thunder, snow blindness, fog, sleet and hail. The system can be programmed to follow actual weather from the user’s location, adding another layer of realism and excitement. The challenges don’t stop there. X-Plane offers extensive failure modeling. Engines, controls, cables, landing gear and communications can be set to fail on command or at random. Fellow users or instructors can shutoff systems without the user’s knowledge, helping to develop their coping skills and adaptability. ​The cockpit of the default Cessna 172SP screenshot from XP11. 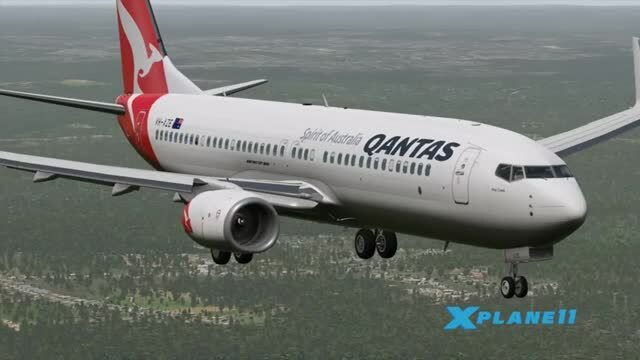 X-Plane’s unparalleled flight dynamics model, gorgeous graphics, wide geographic coverage, depth of aircraft selection, versatile weather and systems handling, extensibility in the form of add-on aircraft and scenery, and realistic flying experience make it the “go-to” flight simulator for a legion of experienced pilots and new flyers. X-Plane has a passionate user base. One user recently described a routine flight delivering supplies in Alaska. Suddenly he was hit with an engine fire! Within seconds, he had to land on the only flat spot within miles: a patch of snow about 800 yards square located one mile from his location. That’s the kind of action loyalists have to come to expect from X-Plane! Created by Laminar Research, X-Plane was originally developed for Mac OS X and is available on Windows and Linux. Keeping up with the increasing use of mobile devices, players can now get X-Plane for Android, webOS, and iOS including iPad, iPhone and iPod Touch. The archive x-plane-11-universal.zip has 8 files and directories contained within it. For anyone who is a little more used to the commercial behemoth that is Microsoft Flight Simulator, the rather stripped back X-Plane might seem like a waste of time. Look beyond the graphical parallels and the features included, though, and you get an absolutely staggering flight simulator to use. As a massive fan of the MFS series as a whole, it came as a surprise to me just how defined X-Plane was in comparison. For all of the nice features and ticked boxes that FSX in particular brings to the table for Microsoft, it simply cannot get near X-Plane for realism. For a start, X-Plane uses a flight dynamics engine that is more complex than the meaning of life. It’s a difficult one to work with and can leave you really confused at first. Get through those first few hours of mind numbing crashes and repeat errors, and you’ll find that you have one of the deepest and most enjoyable fight simulation tools around. It’s absolutely intensive attention to detail makes it a massively powerful change from the more user-friendly FSX, and although it can be challenging the reward for getting this right can be absolutely incredible. This demo product gives you access to the same features as the real thing, except you can only get fifteen minutes of flight before having to start again. This can be a bit frustrating but will give you enough time to take off and see the world around you in all of its glory. Whilst the demo is lacking all of the main add-ons for creating planes and scenery, the full version does come with this – so if you like the demo and fancy using the high-end physics engine to make some aircraft yourself, you can do so with ease. Thanks to the incredibly realistic flight dynamics engine within X-Plane, you’ll notice a pretty staggering difference between how your aircraft reacts here versus how it would have reacted in FSX. Whilst FSX is absolutely spot on, this uses a different style entirely that makes customizing and improving your aircraft a lot easier. In my opinion, this is an aircraft simulator that is built for modders and those who love to experiment rather than a plug-and-play flight simulator that aviation fans can boot up and start having fun with on the same day. If you fancy a change up from FSX, then there is no better alternative to try out than X-Plane. so far so good I have much to learn. Am currently flying FSX and enjoy multiplayer flying with my son. Does x-plane have this feature? Thanks. was going to download x plane 11, but have minimal mb's to just throw away by downloading - I was all set when I read how it didn't work for someone using same system as me., windows 7.., anyone help before I pass this by and save my mmb's ? after installing X Plane 11 free download setup .Its winzip file which one has to extract and look out for setup. three folders appear 1 folder .. 2 folder screenshots which is totally empty . 3 folder Trailer videos and rest are the extract files. The addon aircraft su 27 demo download the setup window appears and screenshots are there of aircraft.Please look into the matter and provide the xplane setup which runs on windows 7. The installers have now been updated to X-Plane version 11.